SkiBiking in Scotland is like nowhere else, much of which can be attributed to the region's unique topography. Although defined as mountains, they are much more like extra large hills, both in shape and altitude. To put that into context, Cairngorm mountain summit is at 1097m or 3600 feet. This is way below even the base station of your typical Alpine resort, which would be 1500m or 4900 feet for an average resort and in the Rockies it would be 2400m or 7900 feet. Of course Scotland is a 1000 miles North of the Alps, so snow falls closer to sea level, but Scotland is also surrounded by sea and never more than 100 miles away. These factors can lead to sudden temperature variances, which cause multiple freeze-thaw cycles and powder snow is uncommon, but you will come across a lot of the other types, even snow marbles, something I had never seen before. Scotland's ski resorts do receive a lot of snowfall, but the challenge for their resorts is keeping it, so picket fences are installed along the sides of the runs to prevent the high winds from scouring it away and all of Scotland's ski areas are above the tree line. Westerly 55-65mph, locally 90mph in gusts at first, will ease to 50 mph gusts 70-80mph. Intermittent snow/hail; small risk of lightning, cloud rapidly varying, bursts of sunshine, particularly East, air very clear, but visibility intermittently near zero in snow and cloud. Temp @900m dropping slowly to around -3, but will feel as cold as -22 directly in the wind. As a consequence of these turbulent conditions, the growth of Scottish ski tourist has been stunted and with the recent need to appease environmental conservationists, mountain infrastructure way below modern standards. There is only one Gondola in operation (Nevis Range) and chairlifts are uncommon, in Scotland the Poma and T-bar drag lifts are still king of the hill. This can be a challenge sliding on foot-skis with a skibike at your side, how an average skibiker would manage balanced on a freestyle skibike is a moot point. 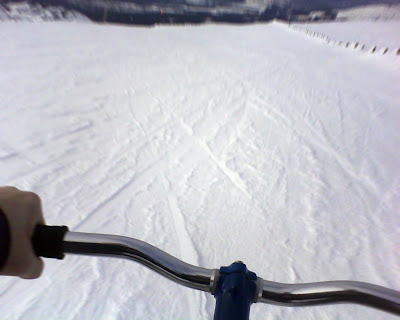 Having listed all the pitfalls of skibiking in Scotland, let me now explain the reason I went there twice in 2010 and would gladly go back again. If you live in the UK, it doesn't feel "foreign", you have the same road signs, drive on the same side of the road, if your car breaks down it can be fixed by someone who will speak (approximately) the same language. You can throw what you need in the boot of a car and just go when you want, no airport security checks, no delayed flights, no transfers, no hassles. For people who live in the North of England the journey can take as little as 5 hours, door to door. Most Scottish ski stations are near towns where you can find spare skibike parts and sundry items at reasonable High Street prices, a few even have cut price warehouse outlets in resort. Hotels accommodation is readily available at short notice, for a two figure sum. Best of all you won't be paying hidden expenses that eat into your budget, such as; cash card withdrawal fees, transaction charges or foreign exchange commissions. If you hurt yourself, or feel unwell, you will have access to the same standard of health care you would expect at home. But do make sure to arrange insurance to pay the cost of mountain rescue in the case of an accident. Whatever your snow sliding discipline, in Scotland you will get a lot better at it (or die), you will encounter variety you will never find anywhere else. Learn to adapt your technique and never be intimidated by poor conditions again. When you take your new found skills to a sunny Alpine resort you will skibike like a god. Thanks to the convenience of the Internet, skibikers can easily arrange accommodation at a couple of days notice at very favourable rates, I use LateRooms which enables you to quickly find accommodation close to where you want to go and filter the results by price or proximity, depending on your priorities. Likewise the Internet allows you to track the weather via webcams, I use the SnowEye website to really see what conditions are really like in resort and not trust on the opinion of the tourist centre pr person. Accurate forecasting is also now the norm, at least for the next couple of days, so it is easier to avoid the storms and plan to arrive once conditions have settled down. The key is to remain flexible, if conditions are deteriorate on the West Coast, find out what they're like on the Eastern side and arrange a couple of days skibiking there instead. Aviemore - the premier resort in the UK, the most snow sure location, but the mountain is difficult to access when it is snowing due to a poor uplift design. Glencoe - no data available. Glenshee - covers a large area, varied terrain from beginner to expert, handy location on a arterial road, sparse accommodation or local facilities. Nevis Range - excellent variety, probably the best infrastructure in Scotland, right next to a large provincial town with facilities, alternative activities and nightlife. The Lecht - sheltered, so often remains open when other areas are forced to close, a lower lying ski station area with limited variety and not much vertical drop, no local accommodation or facilities. It had a sublime and solemn effect, so wild, so solitary — no one but ourselves and our little party there . . . I had a little whisky and water, as the people declared pure water would be too chilling.